The Superman Fan Podcast: Episode #371 Part IV: Superman Family Comic Book Cover Dated July 1964: Superman's Pal Jimmy Olsen #78! Episode #371 Part IV: Superman Family Comic Book Cover Dated July 1964: Superman's Pal Jimmy Olsen #78! Superman's Pal Jimmy Olsen 78, July 1964! Download Episode 371 Part IV! 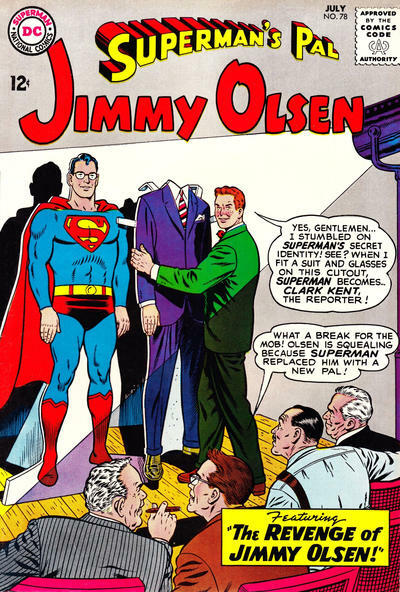 SUPERMAN'S PAL JIMMY OLSEN 78, July 1964, was published on May 28, 1964. It contained 32 pages for the cover price of 12¢. Mort Weisinger was the editor. The cover was pencilled by Curt Swan, inked by George Klein and lettered by Ira Schnapp. - (6:26) THE REVENGE OF JIMMY OLSEN (8 pgs. ), written by Leo Dorfman, pencilled by Curt Swan and inked by George Klein. - (26:17) THE BABY THAT SAVED METROPOLIS (8 pgs.) written by Bill Finger and drawn by Al Plastino. - (38:15) THE RETURN OF JIMMY OLSEN'S LOST LOVE (9 pgs.) written by Jerry Siegel, pencilled by Curt Swan and inked by George Klein. This was Siegel's 80th silver age Superman Family story, and his 11th overall for the era. - (54:30) Elsewhere in DC Comics, 30 titles carried the July or July/August 1964 cover date, according to Mike's Amazing World Of DC Comics. Next Episode: SUPERMAN COMIC BOOKS COVER DATED AUGUST 1964: PART I: 80 PG. GIANT 1 (starring Superman), PART II: WORLD'S FINEST COMICS 143, PART III: SUPERMAN 171, PART IV: ACTION COMICS 315 & PART V: SUPERMAN'S GIRL FRIEND LOIS LANE 51! I thought it was interesting, in the first story, "The Revenge of Jimmy Olsen", that it was almost as if being "Superman's Pal" was a job, rather than a relationship, and Jimmy could be "fired" from it, and stripped of his signal watch, as if it were just a tool of the job, and replaced by another person, whom Superman would then "brief" in the Fortress of Solitude on the "duties" of the job. "The Return of Jimmy Olsen's Lost Love" (In your show notes, above, this is billed as "The Return of Jimmy Olsen's Lost Son", which would be a very different story, I think.) was one of my favorites, as a boy. It seemed, somehow, more "adult" (in the sense of involving deeper, more complicated ideas) than most comic stories of the time. Certainly, seeing Jimmy and Lucy falling in love with each other in other identities presented all sorts of complications, and it was appropriate that these couldn't be resolved in a single 9-page story. I'm looking forward to their meeting again (I think for the final time.) in issue #82. I've always regarded Lucy as a bad girlfriend for Jimmy, because she's always so dismissive of his feelings, but these stories make me think that Jimmy, by two-timing Lucy with Sandra (even though she is really Lucy), while not being honest with Sandra, isn't such a good boyfriend for Lucy. I guess life is more complicated than I thought it was when I was 8. It did seem like Jimmy was being kicked to the curb by everyone. Thanks for noticing the mistake in my show notes. I quickly corrected the story title. That would be a very different story. The final story with Jimmy and Lucy as Magi and Sandra respectively was a mature story for the time, giving adults reading it another level to ponder that would go over the heads of children reading it at the time of publication. That's why I've come to realize that Jerry Siegel was an unsung hero of Superman stories during the silver age.